Below you will find an explanation of each area and how it helps in the education of your child. To start the virtual tours, please click on each of the links below. To see our facility at REM Learning Center, please click here. When children work the Art Area they assert their individuality, enhance creativity, develop planning skills, and experience pride in what they have accomplished. They recognize how materials change (Science).They plan task and carry them out (Independence). When they draw a picture of a person they are using symbols which will help them in reading and writing readiness. When children work in the Block Area they begin to learn cooperation with others and how to work in groups (Social Skills). They are learning classification and sorting of objects. Concepts such as size, length, width and number concepts (Math), addition, subtraction and fractions as well as problem solving are all learned and experienced when children work in the Block Area. Children who enjoy working in the Computer Area learn sequencing and order, how to follow directions, sharing and how to cooperatively play with others (Social Skills). They can improve their coordination skills (Physical Development), by refining eye-hand coordination and learning how to operate a computer mouse and disk. Within this area the children will have the opportunity to experience various media. 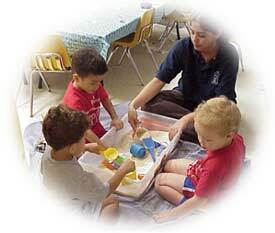 Working with Sand or Water as well as Rice the children will explore different sensations. By using different materials they can recognize cause and effect (Science). Within this area they are using their small muscle skills (Physical Coordination), playing beside other children and learning to get along with others (Social Skills). Many children seem to enjoy this area the most. 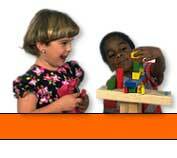 Here they can express their individuality and learn cooperative play with others. They may plan play episodes (Thinking Skills), separate cups or fruits or classify props (Math). When they put on dress-up clothes, snapping, zipping or lacing, they need to use their small motor development (Self-Help Skills). Within the Library area the children begin to understand words are symbols, and build and increase their vocabulary. They see sequencing of events and develop story telling, and listening skills. The reading of a book from left to right is important in their reading development and readiness skills for writing (Language Development). They learn a love for books and how to express their ideas. How to properly treat a book and turn the pages will help for their thirst of knowledge and information in reading. Concepts within this area have a definite link to eye hand coordination skills and the development of visual discrimination (Reading and Writing Readiness). The feeling of completing a task, and developing creative abilities are motivational skills developed and enhanced in this area (Self-esteem and Study Habits). Classification and sorting by color and shape as well as matching (Math) and fine motor development are also skills learned within this area.